Can we write an article about a pregnant girl? I was asked this question when I first started advising at the high school yearbook in 2007. The previous adviser had approved it on their ladder they built the year before, as what they called a “censored story,” something they would run prior review before publishing. Here lied a lot of issues. One, that there was an assumption of prior review based on content. Another, that the students asked me could instead of asking themselves should. And finally, they had no idea who they were going to write about. They were going to write about teenage pregnancy, and that was it. Is the story the pregnancy? Is it the event? In my 2007 scenario, the story was the pregnancy itself. They didn’t even know who they’d cover, because they wanted to cover a topic without regard to the subject. After asking these questions as an adviser, the staff backed down and found more relevant topics to write about. One of my best writers, with two CSPA Gold Circles for feature writing and a first place award for newsfeature writing in the state, proposed a pregnant student as the subject for a feature in the yearbook this year. This student attended school until the day before she went into labor, and only two weeks after a c-section delivery, was back in her seat in the classroom. Here, she found a compelling story, not just about decorating a nursery and baby’s daddy, but about working hard to finish her education. The editors approved her story idea, and the feature is beautifully written. Back in 2007, running an article about teenage pregnancy would have been more controversial. Now, in an age where 16 and Pregnant and Teen Mom have been on the air for years, the concept isn’t as shocking. That’s not to say there wasn’t a reaction this year. In fact, my design editor’s mother was shocked by the presence of the article in the yearbook. She asked my student if there was really a pregnant girl at her school, and she was even more shocked to hear there were a few more at the school this year. In this sense, the awareness of the issue is important, to a certain extent. But when people read the article to see who the girl really is, the story itself shines through. I received no complaints about the article from parents, students or faculty members. In his national workshop sessions, one of my favorite yearbook evangelists, Steve Kent, regularly discourages students from doing stories on pregnancy, drugs or any other controversial topic. It’s not that he’s opposed to doing something different, it’s that he’s seen the same old worn cliches before. When most students go to write one of these articles, it ends up falling into one of the old tropes, all when the students think they’re being edgy by including controversial material. On the other hand, a well-written story that tells genuine emotions of people, with a great angle through a student’s perspective is always welcome in the yearbook. Focusing on creative angles that tell stories of people makes an article truly worth reading. Our newspaper did have a beat system last year. It worked some of the time. It’s failure was in the accountability. I now see that. Although, the beat system is a great way to generate news, these categories were too broad and large to handle. Using the beat system, students can learn sources. A beat system will require accountability–that is the most difficult part. Academic clubs (National Honor Society, Quill & Scroll, Junior Historians). Service clubs (Key, Anchor, Library Crew). Leadership clubs (Family, Career and Community Leaders of America, Student Council). Vocational clubs (DECA, FFA, Skills USA/VICA). Maybe students would not have been so overwhelmed dealing with many sources. It is important to assign students a beat because they become knowledgeable in sources, stories, an organization’s calendar and mission. Each major issue in reporting is determined by our success to convert high school students in to high school journalists. Not every student on the roll will major in journalism or photography, but we should be converting them to journalism principles. In a small high school sometimes students take the class because a parent took it 30 years ago and it was fun. It is, but it is work. A beat system can help students become responsible to a group in addition to the newspaper or yearbook staff. Next year, students will choose a beat and be required to turn in a report every two weeks. We will discuss and explain the eight principles from the textbook for covering a beat. This will help them be prepared and to manage the flow of information for newspaper and yearbook. If my yearbook students and second semester journalism students work as media teams, it should be successful. With convergence, it makes sense for a team to produce content for the different platforms. Beats work differently for yearbook, although spreads are basically a beat if you are covering a group. The consistency and familiarity over time can help students see the value and efficiency in a beat system. Accountability will work by producing features and a folder of photos of the group posted to our server. Writing for readers is a public trust for a journalist. By asking the readers’ questions, the reporter will become the public’s ombudsman. Students working toward success in beat reporting should begin with shoe leather. Why should I care about beats? Thus far, my advising experience is limited to yearbook, but we have had marginal success with a beat system. I enacted this system because I was tired of fighting with my staff about coverage that was not directly related to high school. My staff is comprised of high school students, but our yearbook is a PK-12 district-wide yearbook. And, let’s face it; no high school student wants to hang out with sixth graders looking for a story. Initially, our beats were divided by teacher. For example, Ms. M. was the business teacher, freshman class sponsor, FBLA adviser, and student council adviser. A staffer was assigned the “Ms. M. beat.” I had hoped that teachers would be more apt to take time to talk to my staffers if they had only one staffer assigned to them, rather than a staffer for freshman class stuff, another for FBLA, another for business classes, etc. At least once every two weeks, the staff member was required to sit down with their beat person for a short interview. The interview could be about almost anything. Usually, they comprised follow-ups to events that had occurred since their last meeting and notes about what was coming up in this teacher’s areas. This was too basic to be of much use where high school teachers were concerned, as there was not usually information that was brand new to the staffers. However, this was vital in increasing our coverage of middle school and elementary school. Previously, unless it was on the district calendar or we happened to stumble upon it, most middle school and elementary school events went uncovered or covered in a very superficial manner. In addition to these teacher-specific beats, students were assigned more broad beats. I found that letting students create a list of beats they would like to have was crucial. They immediately felt more ownership in their duties, which produced better quality assignments. Occasionally, a student would request a beat which we had not covered previously, so the influx of new ideas in this way was also beneficial. By switching to a beat system, our coverage expanded dramatically. The student relied much less on what they already knew was important and went looking for what was interesting. Our book sales to students in grades pre-kindergarten through eighth increase dramatically because they felt like the yearbook would be relevant to them and they had a better chance of being included. Our sales to teachers and other adults increased as well because they yearbook wasn’t essentially the same book every year as it had been before the implementation of beats. After every two week beat report, staffers were required to submit in writing at least one viable story idea, though submitting more ideas more frequently was encouraged. For the most part, stories discovered or pursued through a particular beat were assigned to that staff member. But often it was not always that clear-cut. Stories would overlap several beats, or a single staffer would have too many great potential stories at once. Those were handled on a case-by-case basis determined by how involved the coverage would be, deadlines, and other coverage responsibilities of staffers. In hindsight, I wish I had a better system for this, as it was always a little too chaotic at first. But, with a small staff, a certain amount of chaos and everyone involved in everything is to be expected. This lesson plan would work as an introduction to how and why beats should be used in student journalism. Jane Ellen Stevens discusses the growing importance of solid beats and beat reporters as news is increasingly accessed online in this article. Amy Dockser Marcus, a healthcare beat reporter for WSJ who won the Pulitzer Prize for Beat Reporting, is a wonderful example of effective beat reporting. A list of several of her articles appears here. Like any good beat reporter, her articles, such as this one about ALS patients, stands solidly on its own. Vagabond Journalism’s blog entry discusses several examples of good beat reporting. Does my newspaper class have a beat system? Honestly, I don’t know for sure. I will be taking over the class in the fall and at this point, I am not entirely sure how anything in that class works right now. I am going to take this opportunity to research more about the beat system and how to effectively incorporate it. The U.S. Army’s: Introduction to Journalism ebook provided an overview of a model I could incorporate into my class. Pages 19-21 discuss the function of the beat system and the necessity “to develop contacts who will lead him to newsworthy events.” Three beats the Army uses are: geographical (everything in a particular unit), functional (what has happened? what is planned?) and special beats (large or complex events). Two keys for a journalist’s success are dependability and personal attitude and “always be polite, punctual, neat and display proper military courtesy.” (20) The Army Assignment Sheet enables communication between editors and journalists. Although these are Army standards, they are essentially the same principles my journalists need as well. I may not require “proper military courtesy,” but I will require students to be courteous to others as well. Another resource: Establishing beats and desks provided more examples of types of beats: subject and again, geographical. These subjects beats could be tweaked a little to be another solution. Some of the beats that could be used in high school could be: academics, athletics, and activities. If we would use a geographical approach, I could assign beats by hallways for academics, although the hallways are not necessarily divided by subject areas. Like most schools, we will be incorporating the Common Core Standards and integrated AP classes, these could be special beats. While all of this information is floating around in my head, I decided I needed to decide on what’s the best approach to implement the beat system. Tips and Suggestions for Building Beat System and Forming a Beat System Lesson Plan provides more ideas to think about and answer to incorporate. Since I am not totally familiar with their past newsgathering routines, it will be essential for students to buy into this system as well. The tips and questions will provide a basis for a conversation with my students and hopefully, help them to realize the benefits and buy into this system. They can help decide what kinds of beats will work best for them, what beats will be covered, and how to accomplish the set expectations. In addition to assigning beats to students’ interests, I think initially it will be crucial to also examine what activities/athletics/academics students participate in so we can adequately cover the beats. For example, I have a small yearbook staff of eight students and this spring four of them were in a spring sport. This was at times challenging to say the least. Lee County High School provided an online model of how to incorporate this beat system: Generating Online Content: The Staff of the Panoptic Online Share Their System and another practical application: Lee County Beat System. I like Grebel’s expectation of their “website should average five new posts per day, not including scrolling announcements.” She also requires students to complete sports reports the morning after the event, regardless of the day. Also, in her beat system, advisers/coaches must sign off on a sheet if there is “no news” to report. These resources could certainly help me to incorporate a beat system into my newspaper class or at a minimum my introduction to journalism class. It is important for students to learn how to develop contacts that they can count on to help them report the news. Especially for the newspaper class, it will be a year of adjustments and I’m not sure if they will buy into the “come early and stay late” approach to beat system. I would have to do a lot of selling of the benefits of the beat system to them before they buy into the concept, especially if they haven’t covered the news in the fashion. I do think the benefits do outweigh the drawbacks though. How can you go wrong with a lead starting, “Want a beer?” The angle of this story completely ruined something that could have been interesting. The article on drug and alcohol use on West Henderson High School’s Wingspan Online disappoints in every way after the first three words. The entire first paragraph not only falls into cliché but seems to be hypothetical. I have heard of contrived dialogue outing reporters who made up quotes, but I have to say this is the first time I have seen a contrived internal conscience discussion. The entire article regurgitates the same information anybody with a computer could find in minutes. The writer should have gotten out of the office and talked to some students. Of course it is going to be hard to get kids to admit underage drinking on the record, but they could have gotten something. How about talking to administrators and teachers about past students (maybe withholding names) who have gone down that road and suffered. Just maybe the writer could have gotten in touch with a sober adult who would share their experience. Another particularly weak angle I found was this article on the Cougar Roar, Brookstone’s online publication. Here the writer (from a school in Georgia) reports on the theft of a Catholic relic in Dublin (not Georgia, Ireland). Given that hers is a Catholic High School, I suppose there is a chance some students may find this story interesting. Unfortunately she seems to have put all her time into a clever lead and forgotten to write a story. While the lead piqued my interest, the rest of the story left me wanting. Is this really a mummified heart from the 1100’s? Or is another thing that represents his heart? Most importantly, however, is a local angle. I feel it would take less than a few phone calls to find a good quote or two from a devout Roman Catholic who was devastated by this theft. Or even spend a few minutes congregating after mass talking to people. This story from Decatur High School’s 3ten.org falls into the cliché trap that Hawthorne warned about. Here we have a student moving from Georgia to Denmark. There are so many ways to make this a better story. First of all, how does the young lady feel about moving to Denmark in the aftermath of last year’s shootings? That is the first thing I thought about so it disappointed me to not find anything about it. Also, this is a huge transition for a young person, it is certainly not going to be easy. How will she cope with the changes? Why is this happening? What were the motivations behind it? Another possible angle would be to tell the story through her friends. In what ways will she be missed? A few funny anecdotes would at least add some personality to the story. I felt this article from the Atlanta Journal Constitution did a pretty good job. Here we have a continuation on a hard news story. It would be easy to just update the original story, just tagging on facts as they come along. Instead the writers got more quotes and moved the angle from the event (the boat crash) to the aftermath. It could have been even better with some more information from the parents. While the reporters couldn’t get access to the parents, they didn’t let that stop them from writing a compelling story. Finally a student publication getting it right. Alyssa Chapin obviously put some thought into her article for East Mecklenburg High School’s The Eagle. While the headline makes me think that the teacher is leaving or retiring, the article doesn’t start with the same old list of accomplishments or a cheesy cliché. Instead I get a feel for this teacher’s passion and where that passion comes from. The fact that she is leaving, which was fairly obvious to me and probably more obvious to regular readers, is held off until the middle of the article. While the article is quite good and the angle is successfully weaved throughout, I think one or two quotes from a student about her class added somewhere near the beginning could have made it even better. What do you miss most from your country? What do you like most about Missoula? How is Hellgate different? What is your favorite class? The answers for each student were, as you might imagine, uninspired and boring. You can pretty much tell they were bored just answering the questions. The result is no one knows anything about these students and there was no story told. I see this as a great opportunity missed. I didn’t teach those students in Introduction to Journalism. What I learned from them was what I needed to teach to those I do have in Intro. I, like many others, use examples from Steve Hartman’s series “Everybody Has a Story”. In addition, Poynter has an excellent interview with Hartman about the series and his methods. Another example I use with students is States of Mind by Brad Herzog. What students come to realize and what instruction needs to focus on is interviewing skills. Students need to learn to prepare, do a little background research and develop thoughtful questions that will elicit storytelling responses. They get some modeling by watching the examples mentioned above. Another resource I use is Creative interviewing: The writer’s guide to gathering information by asking questions by Ken Metzler. Questions in this book provide a starting point to get students thinking beyond the basics. Once students write drafts of a profile, I have them conduct a peer review. This first requires them to develop a set of criteria to review. I’ve put last year’s into a Google form they can fill out as they read each other’s work. It streamlines the process and makes distributing feedback easier. Students still struggle with finding the angle. Often, however, the peer review provides some feedback in this regard. Someone looking at another’s work from a more objective standpoint is helpful. I hope the journalists from my Intro class who are on the publication staff next year won’t turn out material like the now infamous foreign exchange student spread. During my first year of teaching yearbook, I developed a biweekly beat assignment for everyone on staff to complete. I developed a chart that listed all clubs and academic classes. Each student had to sign-up for one of these. Then, each student had to complete an information sheet that contained what was done on the beat and relevant information. This sheet had to be turned in by the second Friday. I would go through these completed beats and compile these into a file to be given to the individual, at the time I was completely unaware of the Maestro method, who would be assigned to create that spread or page. This worked well for this first year and even into my second year, since I needed to conduct a rhythm to the inter workings of this staff that previously had no deadlines until the end of the year, and knew nothing about journalism ethics and practices of creating a spread. Going into my third, and soon to be seventh year of advising, I have grown fond of a calendar and basically have the entire staff cover important events, like Homecoming week; that is one week that I mandate every student to record observations, take pictures, conduct interviews and even attend meetings, the decorations and the dance, if possible and not attending on their own. Then on Monday, I sort through and compile this information for the team assigned. Again, I like to think of a beat as accessing as much information as possible by using all of my staff members, rather than just the three or four who are assigned that topic. I have assigned my editors various administrators and department heads, but to be honest, these individuals are not very helpful. I would find my editors returning frustrated and aggravated that their emails go unanswered or that the principal is never in her office. While I was at JEA Seattle in April, I had the pleasure of sitting in on a session with Mary Kay Downes, a remarkable and talented yearbook adviser, who suggested using a Beat System, but instead of using teachers or any adult staff, seek out students. Students who are ones that are super into science or is a drama kid who just adores English – have your staff seek out these individual students to get the scoop on what is going on in the academic areas and the clubs. Upon my quest to find yet another way to incorporate beats for yearbook, I came across this idea from Francis Howell Central High School from JEA. Instead of calling them beats, this staff refers to them as briefs, which are a mandated assignment, two per month, and are content for the publication’s web site. Another is from North Central High School’s idea of developing content for their online publication as well. So all of these various web assignments feed right into their online publication, NCHS Live! 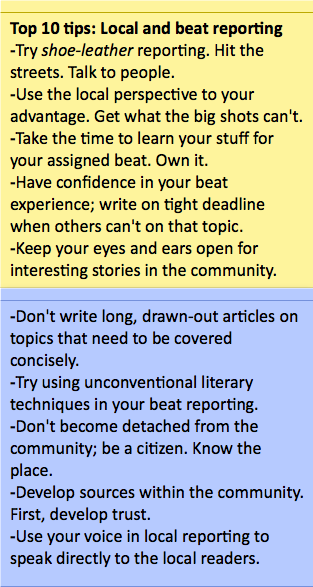 I would highly recommend any journalism adviser to develop or at least try one of these ideas to incorporate beats as part of a staff’s regular system of reporting. Just think of the coverage that is just waiting them to uncover.